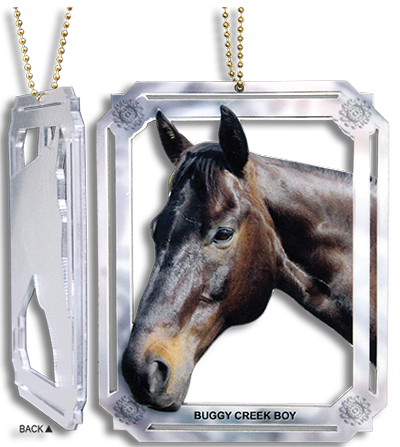 What You Need To Know: Up to 4" x 6" in size and made from your photos, our 1/8"- thick acrylic Ornaments are bigger and better than any others we know (for a closer look, click here), especially at just $19.95, plus they're actually cut to the shape of horse and rider (or other subject), with more available options (such as added text or graphics)--leaving little doubt why four major horse magazines (Horse Illustrated, Young Rider, Dressage Today and Equine Journal) have included them in their holiday gift guides or similar editorial coverage. We'll gladly add text to your ornament for $10 per line, or graphics (logos, extra photos, etc.) at $10 each. And if you prefer something other than a holiday ribbon, we can finish your ornament four other ways: 1) on a Beaded Chain, 2) with a Magnet on back, 3) as an Ornamental Pin, or 4) on a Key Chain. The ornamental pin and key chain, by the way, we usually recommend making smaller (4" x 4.375") but all can be sized to your needs. Note: hanging tabs are clear, not white. 9 Reasons Our Ornaments Are Better—Plus Easiest To Order: 1) Our Ornaments are bigger and thicker, plus cut to shape, with more options than any others we know; 2) They’ve also been selected for the holiday gift guides or similar articles in at least 5 major publications: Young Rider Magazine, Horse Illustrated, Dressage Today, Equine Journal and Cat Fancy, among others; 3) Our laser-cut paths are programmed by degreed commercial artists better able to follow "horizon lines" and visualize your finished product, enabling us to also automatically make more intricate and extensive cuts without additional charges; 3) Each Ornament is protected by a thick, high-gloss, premium-clarity laminate, shielding its surface from moisture, scratching and UV fading; 4) Our laser-cut edges stay smooth and clean (unlike frayed and lifting edges that can occur over time when saw-cut); 5) Each print is mounted on a less-distracting clear acrylic (instead of the colored acrylics sometimes needed to conceal saw-cut scratches), with a shiny silver print backing; 6) You need only upload or email your photos to us (that's ALL you need do) and we’ll handle all image cropping/layout/design (you can request a PDF for review) plus we’ll automatically sharpen, color adjust, etc., your images; 7) Or send us a photo before ordering and we’ll gladly pre-check picture quality, etc. ; and 8) We can add text/logos/graphics, retouch your photo, combine pictures in the same Ornament, or even make yours 2-sided, for an extra fee. What We'd Also Like You To Know: "We absolutely love the ornament," explained a Minnesota mom, who ordered one featuring her daughter competing for the final time on her first horse, Grady. "Savannah was taken back and almost cried," the mother shared. "We have received many compliments." "I'm absolutely thrilled," an Ohio mother similarly exclaimed, after receiving 10 ornaments all ordered as Christmas gifts for her grown daughter. "I know she will love them as this is such a walk down memory lane with some of her most favorite animals. I'd love for everyone to be able to share something special like this with their friends and family. The detail is amazing.... I can't thank you enough for these!" Meantime, a South Carolina riding instructor who ordered seven as gifts for family and friends had one prove perhaps just a little too popular: "I'd wrapped all the ornaments and set them under the tree and the newest member of our family (a yellow lab puppy) got my parent's ornament and chewed on it," she said. "My mom is really wanting a fresh one. Can you make another?" We did and are told it now hangs in her mother's kitchen year round. And as for the rest of the ornaments, "they turned out beautifully and everyone was so pleased," including one of her riding students, a college-age girl: "She LOVES her ornament and is going to hang it in her dorm room." The ornament we replaced, by the way, is of a dog named Jake so please note your photos don't have to be equine in nature. We'll gladly handle orders for any of our products honoring dogs, cats, goats, alpacas or other animals, as well as people, or even inanimate objects such as cars, etc. Not sure your photo's good enough? Trying to decide between several pics? Or need some other assistance? Go to our Custom Quote page to upload any images you'd like us to review or to have questions answered before placing your order. For more product info, you're welcome to call us at 1-877-N1-Horse (1-877-614-6773) or fill out our Contact Us form and we will get back to you as soon as possible.